Why grass garden house sometimes dry, not lush and green? In fact, it is maintained properly. In fact, the base of the problem not only in treatment, but also at the beginning of planting grass. There are several things that must be observed at the time of initial planting grass. Second, the land will be planted loosed first. Leave it up to 3 days, until the land dry up and look destroyed. Then the soil is mixed with sand, next water flush. Grass ready to be planted. Grass would mushrooming. 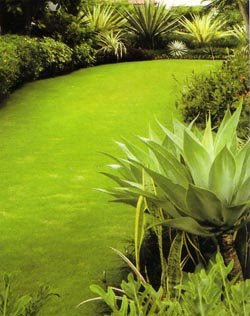 Third, a good grass to plant when the summer or rainy. Because if you planted was much rain, grass growth will be hampered. Fourth, in the beginning of the planting, grass flushing three times a day, for a week. The rest, twice daily, morning and afternoon. Fertilizer given a week after planting. Form the manure of a mixture of NPK and Urea. The provision of adequate fertilizer once at the beginning of the planting. The rest is not necessary. Moreover, if the grass looks lush and thick. Except, when the grass is visible yellow. To make green back enough to scatter Urea fertilizer.